A prominent Kenyan Islamist, accused by the United States and United Nations Security Council (UNSC) of supporting the Somali militant group al Shabaab, was shot dead on Tuesday, police said. Radical cleric and terror suspect Sheikh Abubakar Shariff alias Makaburi was shot dead on Tuesday evening outside the Shanzu Law Courts. 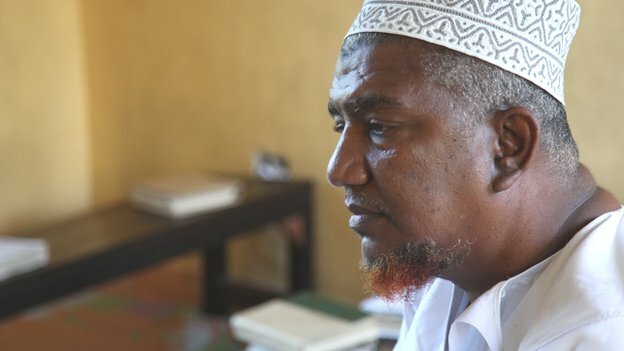 Makaburi becomes the third Muslim cleric to be shot dead in #Mombasa since 2012. No arrests over previous assassinations. Sheikh Abubakar Shariff aka ‘Makaburi was not a Muslim cleric. “I have never preached at a mosque,” he told the writer during an exclusive interview in 2012. The name Sheikh is a title of respect. Sheikh Abubakar Shariff did not know the origin of his nickname Makaburi. He was not sure how the name came up but thought that it was as a result of him staying near a cemetery where he was a vocal resident in the neighbourhood. The US government designated Makaburi as a terrorist. He was one of the three Kenyans on the US government Sanctions List for alleged involvement in terror activities. The others are the late Sheikh Rogo and Omar Awadh Omar, who is currently in a Ugandan jail, accused of involvement in the 2010 World Cup bombings in Kampala. The Kenyan government never won a court case against Makaburi. Makaburi was first arrested on December 21, 2010 alongside Sheikh Rogo, days after bombing of a Kampala Coach bus in Nairobi. The case has never been finalised. In the most recent incident, the courts awarded him Sh670, 000 in damages for unlawful detention of his property after a police raid in his house four years ago. Makaburi met Rogo in late 2002 and the two were close friends for almost a decade. Makaburi said he was touched by Rogo’s preaching on Jihad. Makaburi did not have a job. He earned a living through managing two flats owned by his sister. Makaburi was an avid reader who had a room in his home designated as a library. The library was full of books with his favourite subjects being history and Islam. He said that if there was something he wanted to do was to be a history teacher. Makaburi was a hard-line Muslim who propagated what he called as “true Islam.” He said that the best examples of Islam were found in parts of Fallujah in Iraq, Taliban-controlled Afghanistan and parts of Somalia under the leadership of radical Al-Shabaab militants. Makaburi was banned from using flights as a means of transport. As a designated terrorist, and a target of sanctions by both the UN Security Council and the US, he was not to be allowed on a plane. Makaburi was not allowed to leave his home area in Mombasa without notifying the police. Since December 2010, he was ordered to report to the police every Tuesday. Makaburi spoke fiercely about death and said that he was very ready to die. However, he is a man who feared for his life and lived in hideouts for a large part of his life after the killing of Rogo. In one of the instances, he ran to hide in a police station claiming that Anti-Terrorism Police (ATPU) officers were about to kill him. Abubakar Shariff, also known as Makaburi, was killed as he left a court compound about 15 km north of the port city of Mombasa, police chief for Kisauni area Richard Ngtia told journalists. Makaburi had been attending a court hearing. Makaburi and another man were outside the court waiting to be picked up when another vehicle approached and the men were sprayed with bullets, he said. Both were killed. A Reuters witness saw Makaburi’s corpse with bullet wounds to the body and head, before police took it away. Dozens of Makaburi’s supporters gathered nearby demanding police hand over the corpse. Police fired in the air to disperse the crowd. Makaburi’s death could stir fresh unrest in the coastal area where most of Kenya’s Muslims live. Muslim youth clashed with police for three days in February after a man was killed during a police raid on a mosque used by firebrand preachers. Kenyan police have dismissed Islamist charges that they are to blame for extra-judicial killings. Two other leading Islamists have been killed in the past two years. The east African country, the region’s largest economy, is still reeling from an al Shabaab attack on a shopping mall in Nairobi in September in which at least 67 people were killed. Kenya is trying to break up militant recruitment networks among its Muslim community in an effort to end attacks by Somali Islamist militants and sympathizers bent on punishing it for sending troops to Somalia to fight al Shabaab rebels. Tensions on the coast have increased since an attack last month by gunmen on a church in the Mombasa area in which six worshippers were killed. There was no claim of responsibility, but it was similar to other such assaults blamed on Islamists. A report by the United Nations monitoring group on Somalia said Makaburi had an influential role in the Kenyan-based Islamist militant group al Hijra, suggesting he had called for attacks on a range of targets in Kenya. The group said al Hijra was working on behalf of al Shabaab. “He became the central figure in terms of al Hijra, in terms of the operations, in terms of relations with al Shabaab,” one Western diplomat said of Makaburi. He said Makaburi had become the most high-profile Islamist activist in Kenya after the killing of Islamist cleric Aboud Rogo in August 2012. The UN Security Council and the United States had accused Makaburi of raising funds and recruiting for al Shabaab. Posted on 2nd April 2014 by newsafrica. This entry was posted in Africa, African Security, Al Shabab, Christainity, Human Rights Violations, Islam, Kenya, Religion, Somalia, Tanzania, Terrorism, Uganda, United Nations, USA and tagged Al-Shabaab, Islam, Kenya, Makaburi, Mombasa, Muslim, Nairobi, Sheikh, Somalia, Tuesday. Bookmark the permalink. « Muslims being terminally eliminated in CAR.UN calls for more troop deployment.